Fly from $499 to $899 per person from select gateways, plus save $1,000 per couple off this cruise. Expires April 30. Click here for eligible departures. Sail Europe’s most iconic rivers: the Main, lined with quaint villages; the castle-studded Rhine; and the Moselle with its steep vineyards. Explore Prague’s Lobkowicz Palace on a Privileged Access tour designed for us by Prince William. Delve into Nuremberg’s history at Nuremberg Castle and the former Nazi Rally Grounds. Taste legendary Moselle Rieslings. Savor Czech, German and French cuisine. 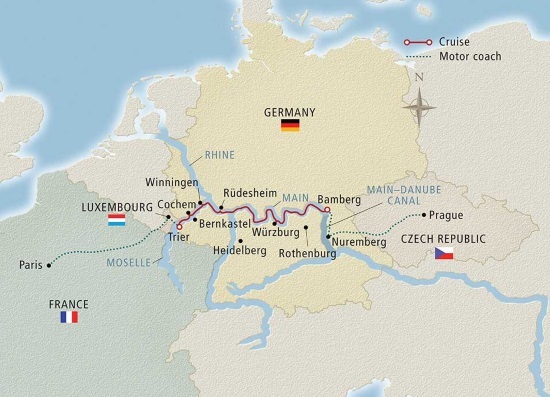 This 12-day journey celebrates Europe’s most luminous ports. Become enchanted by the romance of France’s capital. Browse the art in the Louvre or stroll along the famed Champs-Élysées. Ascend the Eiffel Tower for a breathtaking view of the “City of Light,” dine at a Parisian bistro or enjoy an evening at a cabaret. Two nights in the First-Class Pullman Paris Eiffel Tower Hotel (or similar), daily breakfasts and all transfers between your hotel and ship are included, along with the services of a Viking host. Begin your cruise with three days in the rolling hills of England’s countryside. Visit the historic town of Oxford and the University of Oxford. Tour Highclere Castle, known to audiences worldwide as the setting of the television series Downton Abbey, with Privileged Access and a special welcome for Viking guests. Enjoy included tours to Blenheim Palace and the Cotswolds. Three nights in the First-Class Old Bank Hotel, Oxford (or similar), daily breakfasts, three guided tours and a Eurostar “Chunnel” train between Paris and London are included in this fully escorted program. Extension available only on select sailing dates. Discover the Czech Republic’s vibrant capital, the “City of a Hundred Spires.” Tour Hradcany Castle and its palaces, churches and museums; visit Gothic St. Vitus Cathedral; and stroll along Charles Bridge. Explore Prague’s Jewish heritage in the Jewish Quarter and encounter history and culture in Wenceslas Square. Two nights in the First-Class Hilton Prague Hotel (or similar), daily breakfasts and all transfers between your hotel and ship are included, along with the services of a Viking host.